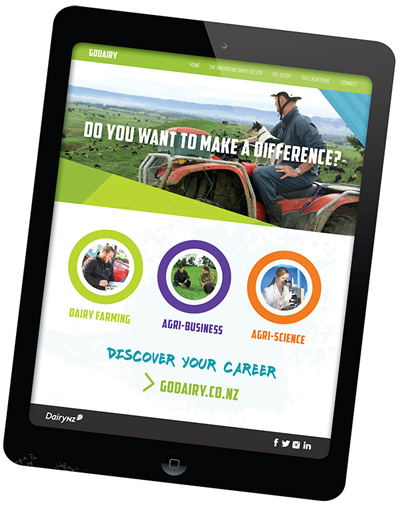 GoDairy is a website supporting young people and career changers to discover a career in the innovative dairy sector - which isn’t just milking cows. The dairy sector needs the very best minds to solve scientific challenges as agri-scientists, work with farmers in agri-business, and dairy farm to produce the best milk in the world. Take the GoDairy quiz to reveal possible workplaces and jobs suited to your likes, wants, and needs. For each career path (agri-science, dairy farming, agri-business) find out what and where to study and train using the interactive map. Read stories about like-minded people and be inspired. Connect with others via social media and in person to make it happen. The dairy sector offers variety, challenges, financial rewards, and many opportunities. Do something that matters: GoDairy.co.nz. Discover facts that make a cow such a special animal with this 3D interactive model - view online or download. Explore New Zealand's dairy industry data with this very cool 3D interactive model - view online or download.